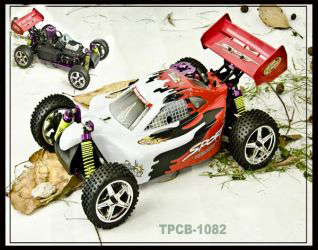 Windhobby 1/10 SCALE GAS POWERED 4WD OFF ROAD BUGGY manufacturers,Windhobby 1/10 SCALE GAS POWERED 4WD OFF ROAD BUGGY exporters,Windhobby 1/10 SCALE GAS POWERED 4WD OFF ROAD BUGGY suppliers,Windhobby 1/10 SCALE GAS POWERED 4WD OFF ROAD BUGGY OEM service. TECHNICAL DATE: Length:350mm Width:200mm Height:122mm Wheelbase:260mm Diameter OfWheel:65*26mm Threat:185mm Round Clearance: 4.5mm Gear Ratio:5.69:1(H)7.85:1(L) Engine:18cxp or 15cxp Packing:Packing:4PCS/CTN CTN SIZE:61.5*38.6*54CM G.W. : 17.